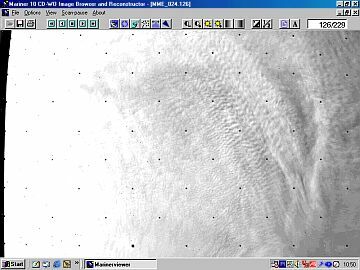 Program MarinerNineView is created for M71_0001 - M71_0009 CD-WO volumes produced by the Science Digital Data Preservation Task, data set NSSDC ID: PSPG-00235 ( other ID 71-051A-04c). This data set has been generated by the Jet Propulsion Laboratory's (JPL) Science Digital Data Preservation Task (SDDPT) by migrating valuable space science data from older, deteriorating magnetic tapes to CD-ROM. . The original data tapes (held in data set 71-051A-04a) were copied directly onto CD-WO. 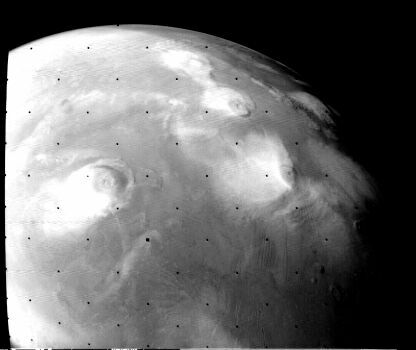 This data set contains the Mariner 9 imaging Experiment Data Records (EDR), which are the raw imaging data of Mars from the Mariner 9 mission, composed of approximately 7300 images obtained by the Mariner 9 TV experiment. 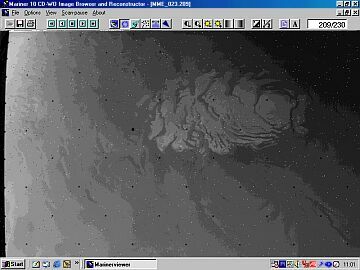 The collection consists of images retrieved from archive EDR magnetic tapes created during the Planetary Image Conversion Task. 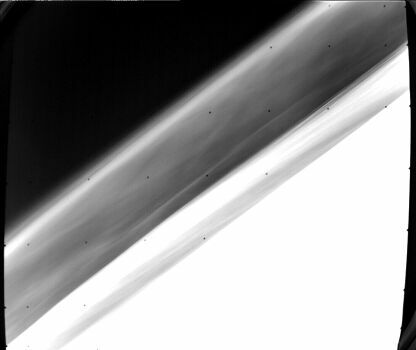 Each Mariner 9 image file consists of 22 blocks containing 31,944 bytes per block. Each block is composed of 33 logical records of 968 bytes each. The tapes were created on an IBM system, so the VICAR Standard Format labels are written in EBCDIC. The images themselves are in arrays of 832 pixels by 700 lines. Each pixel is represented as a 8 bit value; 0 being the least light detected and 255 being the most. MarinerNineView is a Windows viewer for this data set. 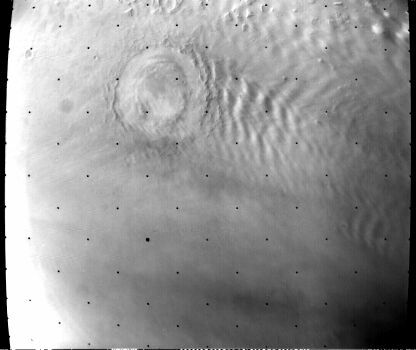 Mariner 9 image before and after despeckle filter. Mariner 9 image before and after brightness gradient reduction. 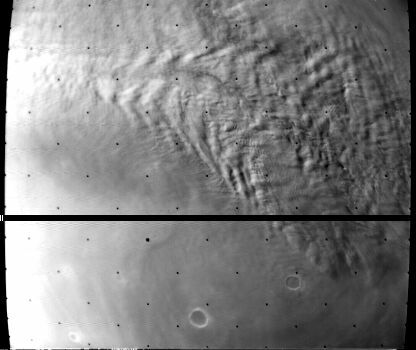 Mariner 9 image before and after contrast stretch. Mariner Mars 71 mission overview. Mariner 9 was launched on May 30, 1971. Between the time of Mars orbit insertion on November 14, 1971 and October 22, 1972, the spacecraft conducted an intensive orbital reconnaissance of the planet. Spacecraft has mapped 100 % of the planet with a resolution of about 1 km, and 5 % with a resolution about 100 meters. 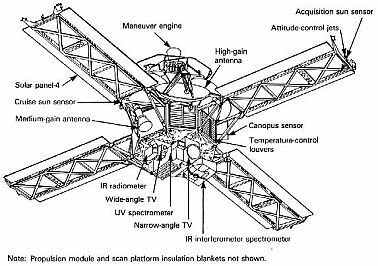 Mariner 9 was equipped with wide-angle and narrow-angle telescope cameras, small format selenium-sulphide vidicon sensors, and mechanical shutters. The wide angle camera had a color filter wheel which functioned for only part of the mission. Diagram from "The New Mars - the Discoveries Of Mariner 9"
Mariner 9 had a narrow and a wide-angle TV imaging camera mounted on a two-degree-of-pointing-freedom scan platform. The combination of scan platform pointing freedom, coupled with the ability to maneuver the celestial orientation of the spacecraft, gave nearly complete sky coverage except for a region within 60 deg of the sun because of thermal constraints. The narrow-angle camera had a 1.1 x 1.4 deg field-of-view while the wide angle had a 10.5 x 13.5 deg field-of-view. The cameras were mounted on the scan platform such that their optical axes were boresighted. Each telemetered TV picture was comprised of 700 scan lines and 832 picture elements (pixels) per scan line, giving an angular resolution of about 6" per pixel for the narrow-angle camera. The wide-angle camera had a grid of 111 geometric calibration reseaux and the narrow-angle camera had 63 reseaux, allowing sub-pixel geometric measurement accuracies to be achieved within each picture. In addition to the reseaux, star images were taken during the interplanetary cruise and also while orbiting Mars to determine and then monitor other geometric properties of the cameras. The narrow angle camera had a detection threshold of 9th visual magnitude, enabling at least a few stars to be imaged in any long exposure picture. Focal lengths and relative camera alignments were computed from the star images and were found to be stable to an accuracy of a pixel throughout the mission. During the dust storm, four strange dark spots had been visible on the surface (three on this picture). 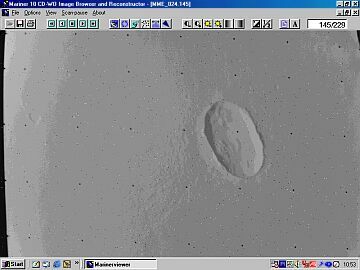 As the storm subsided, it became clear that these were enormous craters, as much as 40 to 50 miles wide. What was most unusual about them was that each was perched atop the mountain. At JPL image team announced on December 1971 its surprising conclusion : They were volcanoes. Mariner 9 wide angle camera. Earth-based telescopic observers classified Martian clouds into three groups: white, blue an yellow. White clouds are probably mostly water ice crystals and may include crystal hazes of carbon dioxide ice around the poles and at altitudes of 50 km, where carbon dioxide ice can condence. 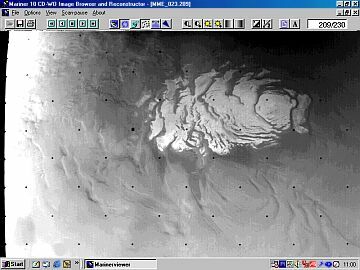 Higher clouds form, as on Earth, where air gets lifted over elevations, such as slopes of volcanoes in the Tharsis region. Dust storms, such as this, carry micron size particles high into Mars' atmosphere. The low density atmosphere requires high wind speds for the movement of particles on Mars. 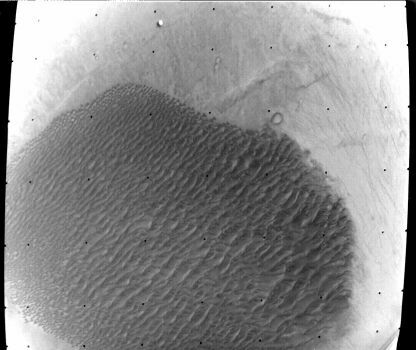 Observations of dust storms show that threshold velocites are archived on Mars and the aeolian processes play a key role in the present-day modification on the surface. 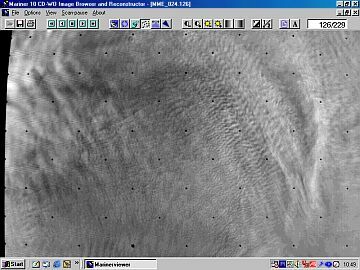 Details of wave cloud associated with a double-ring crater about 218 kilometers in diameter, near 327°, +52°. Waves are roughly 30 kilometers apart. Crater disturb the wind flow. Sand dunes on the floor of a Martian crater. Dune fields, or large masses of wind sculpted dunes, are common on both Mars and Earth. On Mars, since crater rims disturb the wind flow, many of the most remarkable dune fields are formed in crater bottoms. Left - dark dune field forms a 35 x 55 km patch on the floor of a Martian crater. Mariner 9 narrow angle camera. 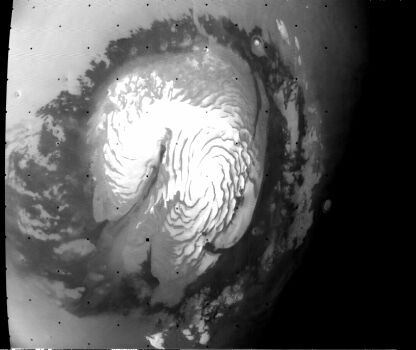 Mariner 9 images revealed the north polar cap, composed of water and carbon dioxide ice. Dark swirls are thought to be frost-free areas. A huge field of dark sand dunes surrounds the cap. Annual condensation and sublimation of carbon dioxide and water frost deposits in the polar regions plays a role in the dust deposition. Images like this indicate dynamic climate on Mars. 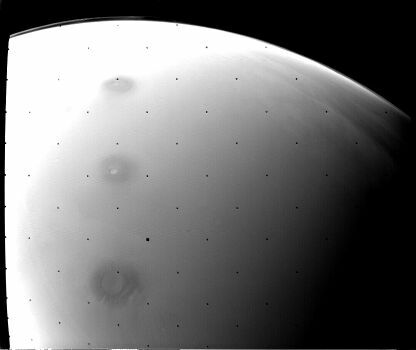 Mariner 9 - narrow angle camera. Horizon in the background shows haze layers 25 - 40 km high, thought to be crystal of carbon dioxide. Flanks of the volcano Hecates Tholus. 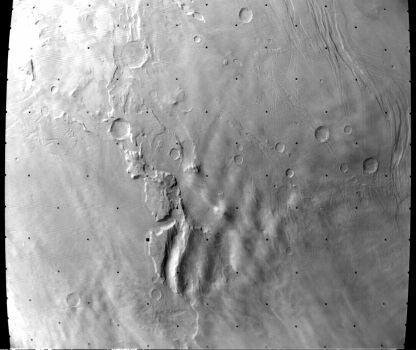 Channels on the flanks of the volcano Hecates Tholus. Various radial channels have been interpreted as erosional ash channels, lava channels or channels eroded by fluvial processes. 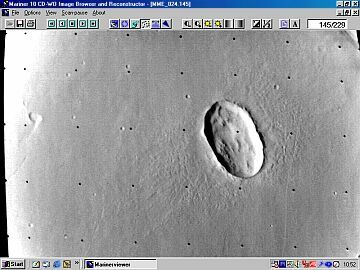 Left - one of hundreds unexpectedly high quality images taken by Mariner 9 wide angle camera with low and medium resolution. 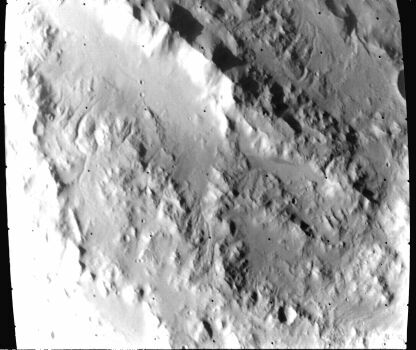 Region near Moreotis Fossae and Tempe Fossae. 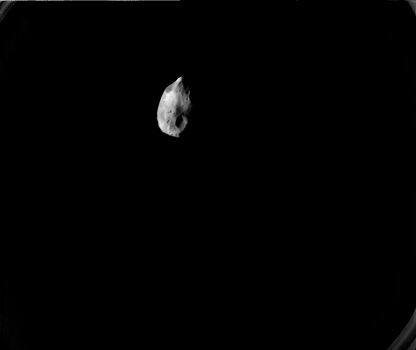 Left - one of hundreds unexpectedly high quality images taken by Mariner 9 narrow angle camera with high resolution. 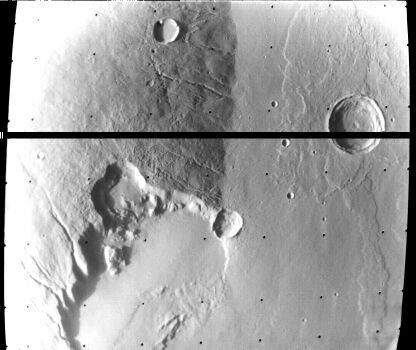 Close-up photos of Phobos and Deimos by Mariner 9 show irregularly shaped satellites about 20 x 28 km and 10 x 16 km, respectively, with heavily cratered surfaces.